Six World Trade Center was an eight-story building in Lower Manhattan in New York City. It opened in 1973 and was the building in the World Trade Center complex that had the fewest stories. The building served as the U.S. Customs House for New York. It was destroyed in 2001 due to the collapse of the North Tower during the September 11 attacks; it is not set to be replaced as part of the new World Trade Center. Six World Trade Center was first proposed in 1968 as part of the original World Trade Center complex. The building was designed by Emery Roth & Sons, along with Yamasaki Associates. Construction was completed in 1973. The original Six World Trade Center was home to the U.S. Customs Service for the state of New York, from 1974 to 2001. It was a 537,693-square-foot (49,953-square-meter), eight-story building, the shortest in the World Trade Center complex. From the Austin J. Tobin Plaza level, on which the main structure was built, it had a height of 92 feet (28 m) but was 105 feet (32 m) above the actual ground level. It was demolished following the destruction of the World Trade Center during the September 11 attacks, when 10 al-Qaeda participants hijacked American Airlines Flight 11 and United Airlines Flight 175, crashing them into the Twin Towers. After burning for less than two hours, both 110-story towers collapsed. 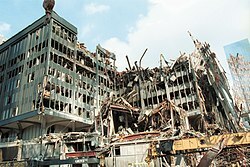 The collapse of the North Tower destroyed Six World Trade Center beyond repair, and the remnants of the building were pulled down using cables. The building's ruins were demolished to make way for reconstruction of the current World Trade Center site. AMEC Construction handled the demolition, in which the building was weakened and then pulled down with cables. The new One World Trade Center stands at the site where Six World Trade Center originally stood. 6 WTC, the building with the large, black crater in the upper left part of the photo. NOAA aerial image following the September 11, 2001 attacks. North is approximately upper right on the image. 6 WTC, upper left corner. Interior of 6 WTC showing debris from north tower in the open area, including a piece that became the World Trade Center cross. ^ The New York Times. "A Nation Challenged: The Site." October 13, 2001. Wikimedia Commons has media related to 6 World Trade Center.